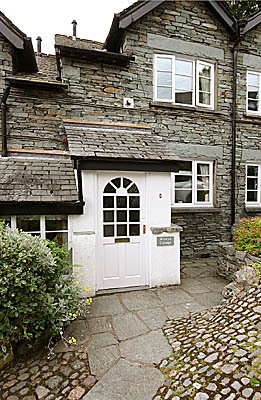 Wilwyn is one of a terrace of 6 small cottages in a cobbled cul-de-sac in a picturesque quiet corner of old Ambleside. 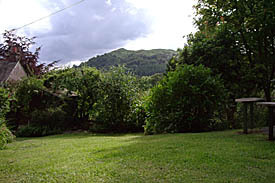 It shares full access to a pleasant garden with the other properties and has its own patio area with furniture. It sleeps three in one double and one single room. There is full central heating. The cottage is ideally placed for the town centre, just a couple of minutes away from all amenities. There is a good view across the town to the fell beyond and many walks, both easy or strenuous, start from the door. Parking is available for one small/medium sized car directly outside the cottage, with an additional lock-up garage 20 metres away. There is safe storage for 2 bikes. 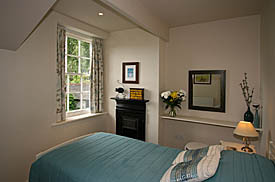 The cottage is well furnished, newly modernised and decorated. Accommodation downstairs consists of a lounge, open staircase, and a well equipped kitchen/dining room with access to the patio and garden. 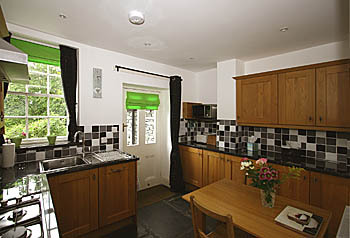 The kitchen has an electric oven with gas hobs, microwave, dish washer, washing machine, fridge and freezer. 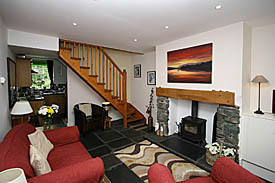 In the lounge there is a woodburning stove, satellite TV, wi-fi access and an iPod station. Upstairs there are the two bedrooms and a shower room with wash basin and WC. The cottage is open all year, with weekly bookings from Saturday to Saturday. Terms are from £367 to £569 per week according to season. Gas, electricity and bedding are all included. We regret no smoking and no pets.